This week I spent every bit of my sewing time working on the birthday quilt, and I’m very pleased that it was done on time. But I was very tired when I finished it and needed to take a break from sewing today. I haven’t sewed on my “Too Good to Cut” Challenge quilt at all. I did think about it, though, and decided on this green fabric for sashings. The close runner-up is a dark amethyst, but the green looks very calm and soothing to me, and it brings out all the different shades of green in the focus fabric. It just looks “more right” than the other fabric. Next week I’ll have more progress to show! I hope everyone else is doing well and having fun with their projects. I like the way your challenge is progressing. 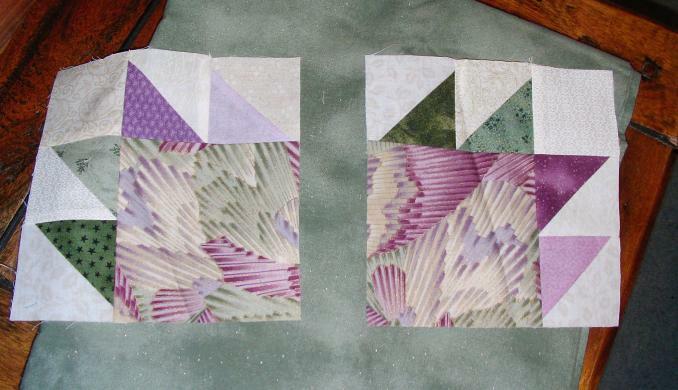 Mine is at a complete stop although I have marked the triangles for the flying geese part of the blocks. If only I could get some sewing done. I haven’t really had the sewing urge the past couple of weeks. Maybe this week I’ll get something done. Have a great week. I’m glad you found a sashing fabric that works well for your quilt. I was at a standstill with my Too Good to Cut Jambalaya quilt, but found some fabric that I think will brighten it up so I am finally back on track. I have the top done and I am working on doing something for the back, using the scraps from the fat eighths. The back is very structured and the back will be “wonky”. It should be fun!